Coach Linda Berger | Holistic Wellness | Oak Park Area Women-Owned Businesses (ownership >=51%, self-reported) | Chamber Members | Madison Street - Oak Park-River Forest Chamber of Commerce, IL ? As a Woman Business Owner, I understand the overwhelm associated with growing our client base and revenue. As we all know Overwhelm is not an effective business strategy. Rather well-thought-out strategies to support bigger goals. 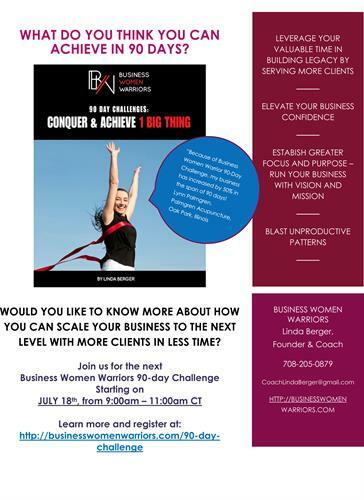 Our proprietary 90-day-Business Women Warrior Challenges are an effective quick start to focus on 1 BIG Goal at a time. Learn to let go of overwhelm by using business tools to double and triple your income. When was the last time someone asked you : What do you really want out of your business? Your business was started to support you not the other way around. Do you support your business or does your business support you? Let's talk. Women in Business -7 Day Quick Start Challenge on Goals.